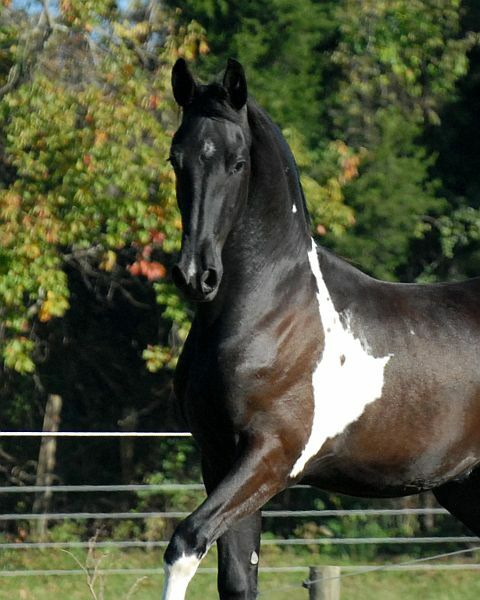 This is an outstanding young stallion by Adonai, making 'King' the first of the 3rd generation of Nico's Pinto Friesian offspring here at Hidden Promise. Adonai has done a wonderful job passing along the adored and respected traits that we so love about him and his sire, Nico. Nico has been extremely pre-potent and consistent in our breeding program, and we were so pleased to find the same results with Adonai. So, needless to say ... we are thrilled with his first offspring, King of Kings. This promising stallion has excellent hock action and activity, as well as balanced, tremendous self carriage... not a surprise as I enjoy the beautifully balanced canter of his sire and grand sire each time I ride them!